We like Orkney - and the ferry is a vital element in the whole island experience. This page describes the important sea route that connects Gills Bay in Caithness, mainland Scotland, to St Margaret's Hope, South Ronaldsay, mainland Orkney. Elsewhere on this site (link below) you'll find a description of the Scrabster to Stromness Orkney ferry link, which is longer, sometimes rougher (some say) and more expensive! However, it is only fair to point out that if going Scrabster to Stromness you get spectacular views of cliffs and the Old Man of Hoy, the famous rock-stack. While the Gills Bay to St Margaret’s Hope crossing (ie the one described here) is not quite so scenically dramatic it still has lots of interest: deserted islands, the war-time drama of Scapa Flow and so on – so you certainly won’t be bored. Especially as the total journey time is only around an hour and the ferry has comfy seats and refreshments too. To avoid confusion, I have to point out that though these ferries run from ‘mainland’ Scotland to Orkney (obviously), when you get to the Orkney archipelago, you find that the largest island is also called ‘Mainland’. This is totally charming and absolutely appropriate for the way Orkney folk see themselves. MV Pentalina on the Gills Bay to St Margaret’s Hope link. There is one slightly disconcerting thing about the MV Pentalina, the vessel currently running the short crossing between Gills Bay (Scotland) and St Margaret’s Hope (Orkney). From ahead or astern of it, you see the sea, a creamy wake, underneath it. As it gets closer you work out that that’s because it is a twin-hulled vessel, a catamaran. Orkney ferry, the MV Pentalina, at St Margaret’s Hope. If you have the leisure time to stand and watch the boat approach the pier, then you may well have already had an introduction to the team at Pentland Ferries, who run this service without any public subsidy. Their little office and waiting room is on the spacious quayside. Best of all, they also have a cafe as part of the complex – though it’s a simple complex. And the day we went through, they were serving great tattie and leek soup. Real Scottish home cooking. Keep up to date, too, about their new vessel, scheduled to take over in 2019 - it's all on the Pentland Ferries website. Gills Bay, Caithness, view of Orkney ferry terminal at Gills Bay, looking from aboard the MV Pentalina. The journey is under an hour, due north, across the Pentland Firth. The number of lighthouses you see on the way gives an indication of how important this passage between the North Sea and the Atlantic still is. The Firth hereabouts has for long had a reputation for fierce tides that funnel into the strait. You may already have seen this if you’ve taken in Duncansby Head Lighthouse on your far north of Scotland wanderings (described in the Vikings tour). Under certain conditions and states of the tide, the whole sea seems to move like a fast-flowing river round the headland here, with Gills Bay off to the west. In this strait at the top of mainland Scotland, the Atlantic Ocean meets the North Sea. The deserted houses on the island of Stroma in the Pentland Firth, as well as the tide-race off its southern tip. This is a calm day. But the MV Pentalina smoothly takes all this in her stride as she heads out from the quayside and forges past the island of Stroma with its scattering of houses (pictured here). All are deserted, as the last permanent inhabitants left in the early 1960s. Stroma stands in the huge currents between ocean and sea, with tidal races at each end. The northerly tide-race is called The Swilkie and is well seen from the ferry. The vessel passes equally close to the smaller island of Swona. Its last residents left in 1974, though the descendants of the cattle they left behind still survive in a feral state (and have been scientifically studied in consequence). Swona is well into the southern approach to Scapa Flow. This stretch of water, with islands all around, was formerly an important anchorage for the Royal Navy in both World Wars – the deserted watchtowers and various look-outs on Hoxa Head, plain on the starboard side, (pictured here) are a reminder. There are empty military buildings here from both these conflicts, on the headlands on either side of Hoxa Sound through which you sail. 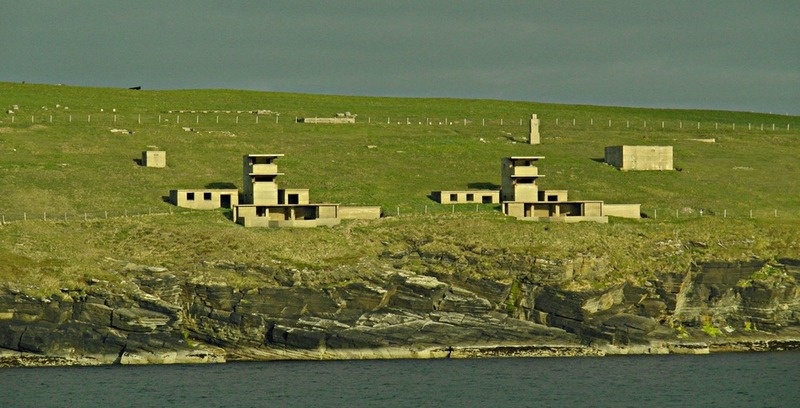 Hoxa Head, Orkney, World War I guard towers overlooking the entrance to Scapa Flow. In fact, here’s a bit for military historians. In October 1918, the German U-boat U116 gained the distinction of being the last U-boat casualty of WWI and the only submarine ever to be sunk by a minefield that was controlled from the shore. Intent on attacking the fleet within the Flow, the vessel entered Hoxa Sound in the darkness of evening and was detected by the hydrophone station at Stanger Head, on the island of Flotta on the west or opposite side of the Sound from Hoxa Head. With the defences thoroughly alerted, searchlights later picked up its periscope. Given its location, the minefield near Roan Head, beyond Stanger Head on Flotta, was activated, with fatal consequences to the U-boat and all its crew. As the ferry swings to starboard towards St Margaret’s Hope, you will become aware, off to port, of the sheer size of the anchorage at Scapa Flow, now silent, peaceful and probably empty, except perhaps for a tanker or two. They are waiting to load oil from the terminal on Flotta. Within a few minutes, the Pentalina reverses to her quayside berth and the ramp goes down. As well as wartime heritage (with the Scapa Flow Visitor Centre and Museum on Hoy an Orkney must see), as you come ashore in St Margaret’s Hope, South Ronaldsay, you should have a long list of other themes, especially prehistory and wildlife. But that’s a story for other pages. Take a look here for other things to see in Orkney. And there’s an alternative Orkney ferry route – Scrabster to Stromness description if you follow that link. Finally, on the subject of ferries, this time inter-island ones, the short crossing from Tingwall on the Orkney mainland brings you to the Egypt of the North – Rousay. Lot’s of information about this fascinating island if you follow the link.